Well, the point of today’s article is to discuss How to Get Exodus Kodi on PS4 and PS3. 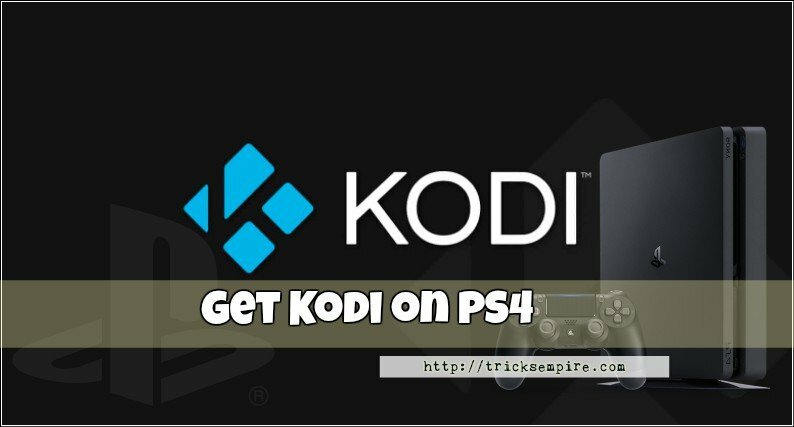 This is basically going to be a guide article to show you how to get Kodi for PlayStation 4 as well as for PlayStation 3. We’ll cover almost everything regarding this topic in this article. So, the Play Station is one of most popular gaming console in the whole gaming industry. Over the years, Sony has made a lot of improvements and changes in its consoles to make it the best gaming console ever. Apart from playing high-end games, Play Station allows you to stream media on your console. The streaming feature is one of the much-needed features in Play Station. We’ve seen many people asking how to install Kodi on PS3 and PS4 consoles. Surprisingly, there are tons of guides and tutorials available on the web. But the reality is all of those guides and tutorials are just time wasting and complete BS. This may sound a little rude, but yes, almost all those guides are just pointless. Don’t worry; I’ll state the reason for my statement in this article itself. So let’s start off our topic by busting a popular myth. 1 Can You Get Kodi on PS4 and PS3? 4 Don’t You Have a Plex Account? Here is How to Create One? 5 How to Setup Plex and Configure the Server? Can You Get Kodi on PS4 and PS3? I’m sure you might have seen those guides where they show you how to install Kodi on PS4 and PS3 in a simple way. But before trying them out, let me clear something. There is no direct or official way to get Kodi working on a Play Station console. The reason is Kodi isn’t compatible with the systems of Play Station. So, technically you can’t get Kodi for any Play Station console. However, the developers of Kodi are working relentlessly on making Kodi available for Play Station consoles. But for now, Kodi doesn’t support any Play Station consoles. All those articles that say how to install Kodi on PS4 don’t really work. You cannot just directly download or install Kodi on PS4 or PS3, Kodi app is not even available in the app store or Play Station. If you are still looking for a way to download Kodi on Ps4 then we’re sorry. However, there’s a great alternative that you can try out. You can continue reading the article if you are interested in the alternate way. There’s an app named Plex in the app store, it is known and considered as the Best Alternative of Kodi. The process is really simple and straightforward. Plex is known for its easy to setup ability, it’s powerful enough to do the job of a Kodi player. Do you have an iPhone or iPad?, Check out How to Get Kodi for iPhone without Jailbreak. As we’ve stated earlier, Kodi is still making its way for Play Station officially. Till the time it comes out for Play Station, you can use Plex to fulfill the needs of having a Kodi player on your console. 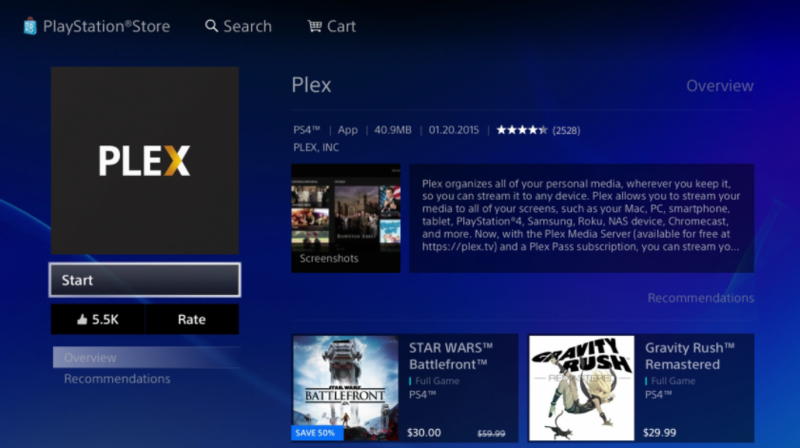 Here’s a step by step guide you have to follow in order to get Plex on PS4 and PS3. 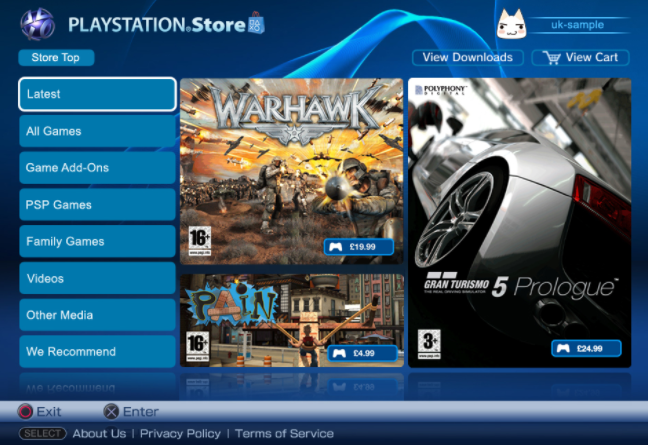 At first, open up the Play Station control, then head over to the PlayStation Store. There you will find a lot of stuff like games, Tv shows, movies etc. Just hop into the “Apps” section to proceed further. Now just go the search option, then type in “Plex” and hit search. Most probably, Plex app will show up at the first place in the search results. Just hit the download option and wait for the “Plex” app to be installed completely. That’s it, now you just have to open up the app and create an account there. Don’t you know how to create an account? check out the guide provided below. 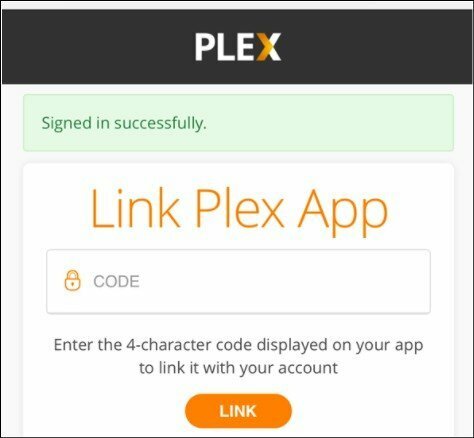 You have to verify your Plex account in order to use the services. Once everything is setup properly, you’ll an error that will look like “App cannot able to connect to the media server”. Don’t freak out, it’s a common error, you can consider it as part of this method. Install Kodi on Roku 4 and Roku 3 and stream all Kodi movies, and other stuff to your tv using a Roku stick. 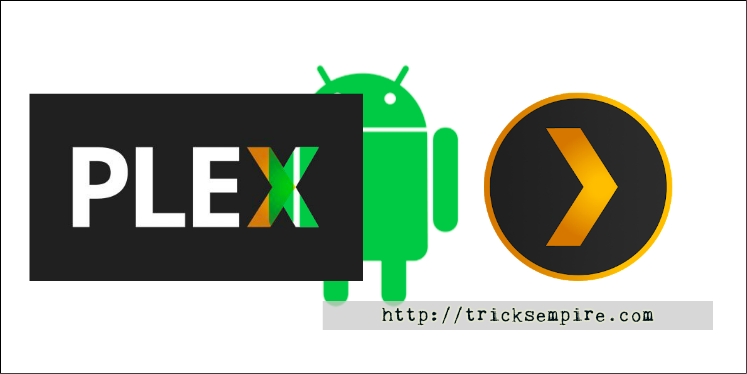 You have to install Plex app on your android device as well in order to use Plex on Play Station. Follow the below mentioned steps carefully. First of all, Open up the Google Play Store on your Android device. Now Search for Plex App in the Google Play Store using the search option. Download the Plex app and let it install on your Android device. 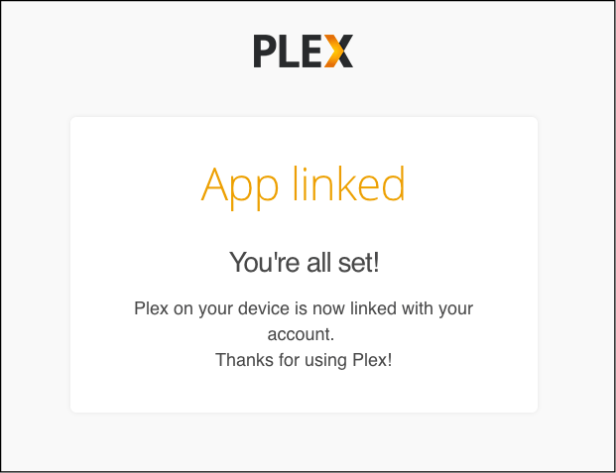 Once the installation is completed, open the app and sign in with your Plex account. Now head over to the settings options, and turn on these options: Show Camera Roll Media, Network Discovery, and Advertise as Server. After turning these options on, you are all set to stream your android device’s media content on your Play Station console. You just have to connect your Android device to the console using the Network discovery option. That’s all, this setup may take a few minutes to do but it’s completely worth it. You can stream pretty much anything on your PlayStation using the Plex app. Just make sure you have a good internet connectivity at your place. If you have a slow speed internet connection, then you may face delays in streaming. So it’s recommended to use a Wifi Network instead of cellular data. If you have a Google Chromecast, you can Install Kodi on Chromecast and stream Kodi stuff to Chromecast effortlessly. Don’t You Have a Plex Account? Here is How to Create One? 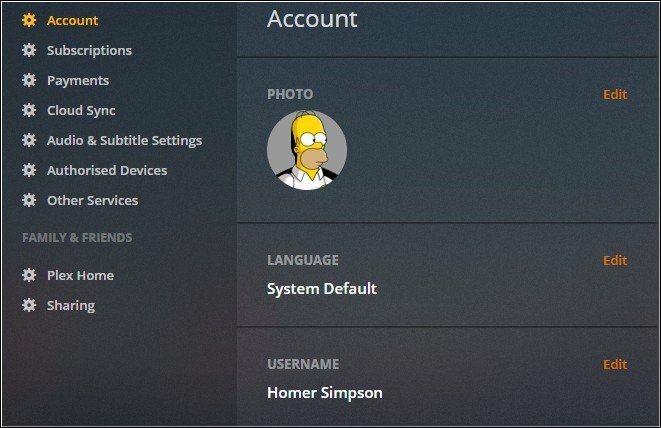 It’s easy to connect Plex with PS4 if you have a Plex Account already. If you don’t have one, you can follow the instructions provided below to create a free plex account. Open up the app on your Android device and make sure you can see the Login or Sign up option as shown in the image below. You may continue logging in with the Google Account or Facebook Account or using the Email. 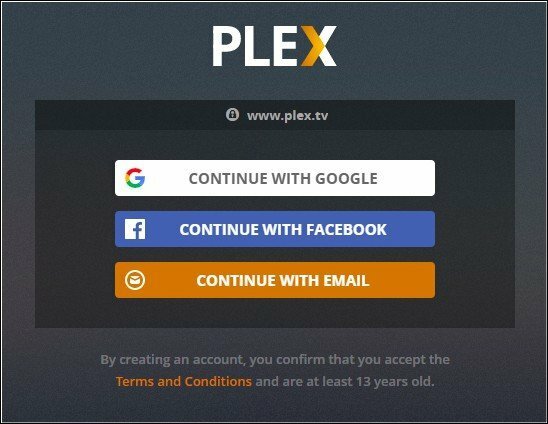 By creating an account, it means you confirm that you accept the terms and conditions of the Plex App. Once you chose any of the options from the available, you will be able to get a profile on Plex. Of course, you can edit your profile and make necessary changes to make it ready and compatible with PS4 and PS3. That’s all you have to do! it is simple right? if you still have any questions and doubts, please leave your comment below. As you have signed up using one of the available sign in or signup options, you don’t need to verify your profile using the confirmation link from your Email ID and so on. How to Setup Plex and Configure the Server? You are almost done and I would say you are just a burger away from watching Kodi stuff on PS4 and PS3 using the Plex app. Anyhow, let’s get started! Switch “ON” PlayStation 4 and make sure it is connected to the Smart TV (to be able to do carry out whatever I show you now). Open up “PlayStation Store” and Tap “Start Plex”. A 4 Digit AlphaNumerical Code will be shown on the Plex App which is installed on PS4 or PS3. You need to enter that 4 Digit Code on the Plex App which is installed on Android or PC. Once you do that without any mistakes, you are all set to use Plex on PS 4 and PS3. Plex is now connected between PS4 and Android device, you can now stream content without any issues. I highly doubt you know the advantages of using Plex on PS3 and PS4, let me discuss few of them right here. Exodus Kodi will stream media on PS4 and PS3 consoles from the internet and you need to do things on your smart tv and it’s not always easy. 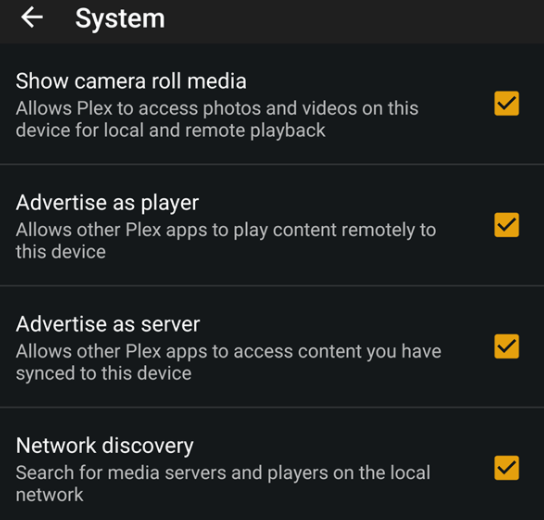 But Plex App can be operated from the PC or Android and iOS smartphones. So you can stream media without any issues. Moreover, Exodus Kodi is limited when it comes to compatibility and of course, that’s the biggest reason for me to start writing this guide; I hope you understand. In order to make this method work, you have to connect your Android device and PlayStation to the same Wifi network. Unless and until you are connected to the same network, this method will not work. You will be able to see your Android device only if your both devices are connected to the same internet network. You may face crashing issues at first, just reboot your android device as well as your PlayStation. This should fix all the minor issues and crashes. If still, the problem persists, it’s better to directly contact the developer in order to get your issue rectified. So, finally, this how to download Kodi for PS4 and PS3 topic has come to its conclusion. As we’ve mentioned earlier, don’t fall for the guides that say how to install Kodi on Ps4 or PS3 etc. There is no official method to Install Kodi App on PS4 or PS3 to date. 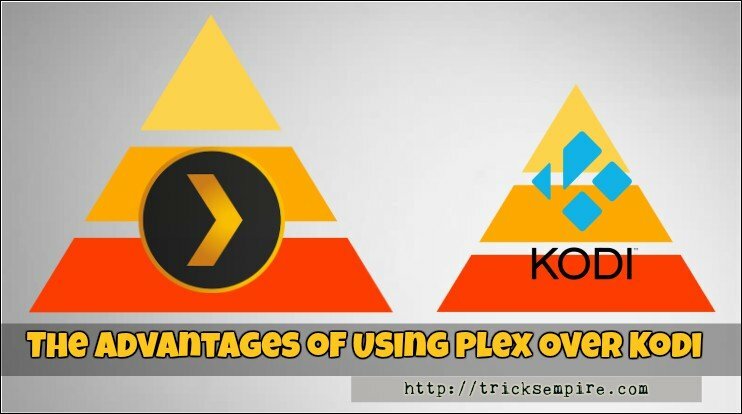 Instead of wasting your time with useless guides, you can follow the wonderful alternative method of installing Plex on PlayStation 4 and PlayStation 3 and stream all Kodi content without any limitations. Share this guide with your friends over social media if you feel this guide is helpful. Great alternative?!?! Plex?!? but Kodi is free completely. Yeah, steven you are right. Next Important Thing: Plex available in both Free and Paid Versions and Supports PS4 and PS3.